Biomedical engineers make some of the most important medical breakthroughs. Become a part of exciting new advances in engineering and medicine. Biomedical engineering (BME) is a dynamic field and combines traditional engineering approaches with other crucial sciences to advance technology and improve quality of life—you could be working to solve problems in biology, chemistry, or medicine. 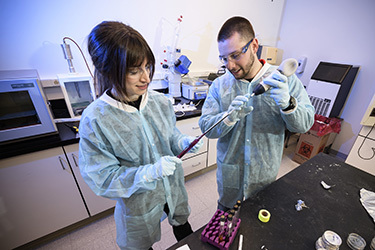 Specialized areas of BME include bioinstrumentation, biomaterials, biomechanics, medical imaging, orthopedic engineering, rehabilitation engineering, and systems physiology. Biomedical engineers continually adapt to meet rapidly evolving requirements of the government, scientific, and medical communities. Your future employment opportunities include designing and testing artificial organs, electrical muscle stimulators, drug delivery systems, artificial joints, prosthetics, and medical imaging technologies. Want to start your own company? Biomedical engineering is a very entrepreneurial field. It is not uncommon to find a BME establishing or working for a startup company. It's never too early—or too late to start managing your career in engineering. Learn more about the Brandeberry Career Development Center. We encourage you to apply skills learned in the classroom through study abroad, undergraduate research, co-op/internships, and/or service learning. You will learn from qualified professionals who actively work in the field of biomedical engineering and work on biomedical engineering projects, allowing you to apply your classroom education to real-world situations. Sean Saffle was a student athlete at Wright State University who turned his passion for engineering and prosthetics into a career. Vanessa Madrigal enrolled at Wright State to play on the tennis team and study biomedical engineering in the College of Engineering and Computer Science. View the Bachelor of Science in Biomedical Engineering program information, degree requirements, and graduation planning strategy in the University Catalog. Review the admission requirements and complete the admission application. Identify your desired major on the application. If you meet university admission requirements you are admitted to the college. Direct Admit status is only available to Direct From High School students who apply for fall admission, and have a 3.25 GPA or better and have no less than a 25 Comp ACT or 1160 SAT score. Direct Admit students are advised in the department of their major within the college. If you are a current student and wish to change majors, go to the WINGS Express major/minor change request form and change your major. If you are an undecided/exploratory student, talk to your advisor about majoring in biomedical engineering. Objective 1: Engage in a career path in BME or a related field. Objective 2: Participate in life-long learning through continuing professional education. Objective 3: Work in a team environment, including multidisciplinary teams, and communicate effectively, both in written form and orally.